Not bad, the chorus is boring though, her rap is ok though. Love the Written In The Stars-esque chorus, but this rest is average. The chorus is the only good thing about it, but the problem is that that is already taken from a much better song. I was never even a massive fan of "Dominos", but this is just wrong. Oh siehe da, Nicki bringt nen Track, den ich zweifellos von Beginn weg supergut finde.<br><br>Ich liebe sphärischen Synthiesound, coole Beats u. Raps die wie die Faust aufs Auge passen. Dazu noch der schöne Ahhh-Chor u. die Melodie. <br><br>So könnte sie auch hierzulande mal n richtigen Hit landen...hoffe es wird released?.. Steal a song much? And if you do that, at least steal something decent, because Dominoes is just blah anyway. She needs to jump in a deep, deep hole. Now. The chorus is the only good thing about it, but the problem is that that is already taken from a much better song. Nicki Minaj is awful, I hate her voice and her lyrics are lame. 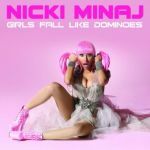 Not as bad as a majority of her non hits, leaning towards 4.<br><br>Peaked at #99 in Australia, 2011. Awesome song, love the echoing effect throughout. Naja, geht gerade noch... Der Refrain ist OK, auf Nickis Parts könnte ich aber dann doch schon eher verzichten. Really good. I like the references and the chorus fits in great. The only problem is the slightly annoying bridge.